The Vivo X5 Max Platinum battery and storage features offered will definitely leave you impressed. Also, with a rear camera of 13 megapixels and a front facing camera of 5 megapixels Vivo X5 Max Platinum can be a good choice over the other phones. It is not a nominal budget phone. The Vivo X5 Max Platinum price in India is 29999 INR. With a platform of Android v4.4.4 Kitkat, you should think twice before going for it. This phone offers some features worth seeking your attention but it may not be able to justify the high price. Within this range, you can get more high-quality camera offered in the market. Have a look at the Vivo X5 Max Platinum specifications minutely. The Vivo X5 Max Platinum mobile specifications include GSM/HSPA/LTE network, alert features like vibration, MP3, WAV ringtones in the phone. The phone comes with 3.55 mm jack, active noise cancellation, and dedicated mic. SIM slots of both types i.e. nano and micro are available. The Vivo X5 Max Platinum display specify a screen resolution of 1080 x 1920 pixels and super AMOLED capacitive touchscreen with the pixel density 401PPI. The phone has display size of 5.5 inches. Multi-touch display with Funtouch 2.0 is also available. The Vivo X5 Max Platinum camera is a good one with 13MP primary and 5 MP secondary camera but not too justifying with the price of the phone. It also gives video recording of 1082p @30 frames per second. Other common features available are geo-tagging, face, panorama, touch to focus and HDR. Thus, the quality of camera offered is satisfactory. The storage given by the phone is impressive. It comes with 16GB internal storage, 3GB RAM, and the micro SD card is expandable up to 256GB. Now you can go on downloading photos, movies, etc., and store it safely without running out of space. The Vivo X5 Max Platinum battery will mesmerize you. It has got a capacity of 4150 mAh with Li-Po type of battery. The battery of the phone cannot be removed but it gives a talk time of 25 hours. You can also check out the common features of the phone such as Bluetooth (v4.0), USB (v2.0),WiFi (802.11a/b/g/n/), Wi-Fi direct, hotspot, GPS(A-GPS). It also has certain sensors like accelerometer, gyroscope, proximity and compass sensors. There are several reasons why you should go for the phone. Specs regarding battery, camera and storage mentioned above are worth consideration. 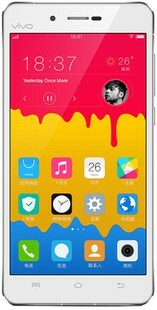 Vivo X5 Max Platinum Edition full specs and reviews as of Apr 2019. Buy it here!